Watermark Software safeguards photos copyrights and photo info privacy. 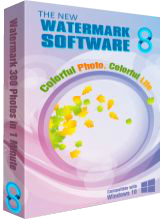 Watermark Software is a superior all-side photo software, which mainly focuses on safeguarding photos copyrights and photo info privacy. It supports beautifying photos, batch watermarking, editing/deleting EXIF info, converting photo format, and keeps a record of processing 300 photos in 1 min. Program features include Mosaic, Bokeh and many other effects as well as adding frames! Video Watermark allows you to embed text, image, logo, sign (including animated) to your video in batch mode, and it is also a video conversion software. With its intuitive and user-friendly interface, the process of watermarking becomes very easy. Everyone can complete the watermarking task with few clicks, it is an excellent solution to protect and annotate your videos. Get Lifetime Updates at $14.95. Video to GIF is another converter manufactured by watermark-software.com, which performs video to GIF conversion. It supports video conversion and changes the output picture format. It’s not just a GIF generator, but also a powerful picture maker. Get Lifetime Updates at $9.95.